Pattaya is a sea-side environment, as are the other regions nearby. In general the sea in the gulf of Thailand is clean and full of marine life. The area has become famous as a destination for diving enthusiasts. There are many diving centres dotted around Pattaya and the Islands. 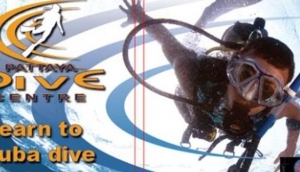 You can find safe instruction and guidance for snorkelling and scuba diving, here. Many of the companies here have qualified instructors who can teach you the basics or ensure that you obtain more senior diving qualifications (PADI).